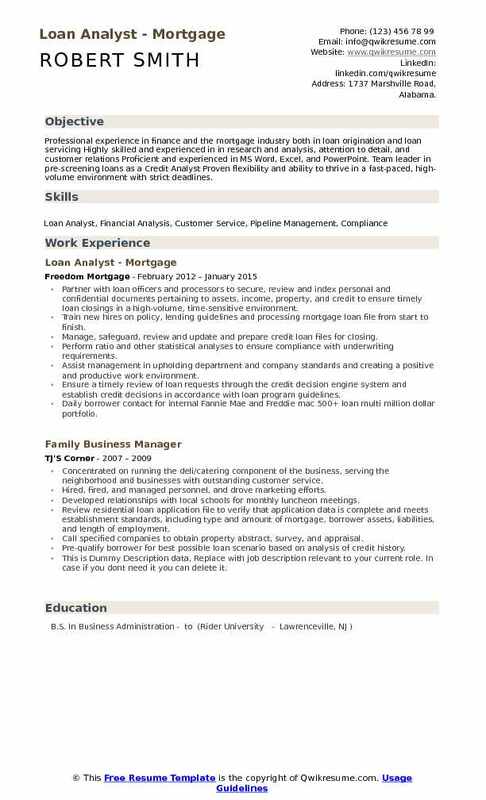 The job role of Loan Analysts is entrusted with the responsibility of analyzing customer requirement and eligibility to repay the debt. 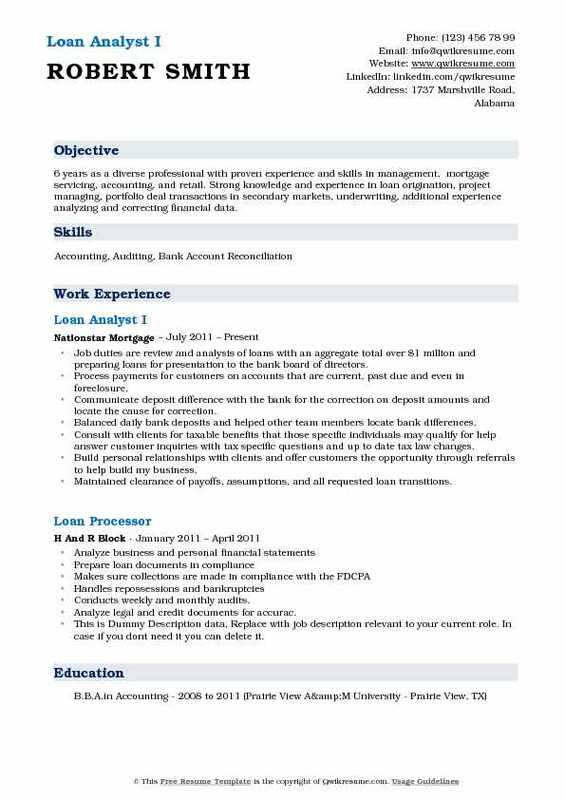 As a typical Loan Analyst Resume, you are expected to understand customer requirement and suggest them with suitable loans based on their repayment capacity. The employers search for masters or degree qualification in subjects like Finance, Accountancy, Commerce, and Management, along with skills of analytical thinking, computer competency, communication, quick learning and interpersonal skills. 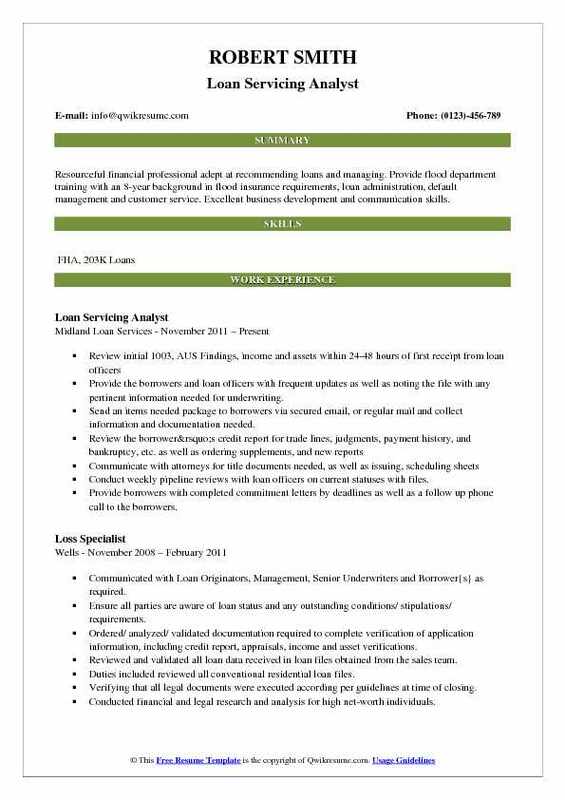 A well-written resume sample for the post of Loan Analyst can help you in getting into the profession of Loan Analyst. 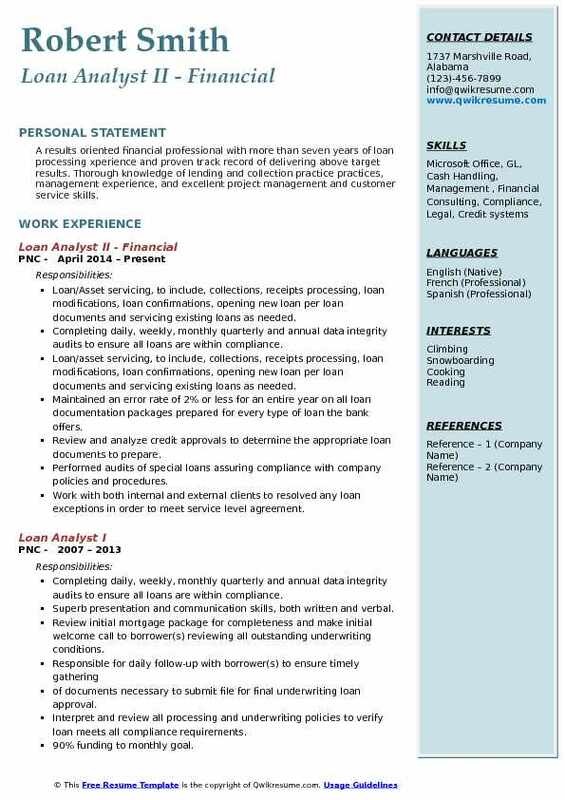 You can follow our guidelines to draft the best sample resume of Loan Analyst that showcase your competencies of financial products, your relevant qualification, and skills to serve customers. 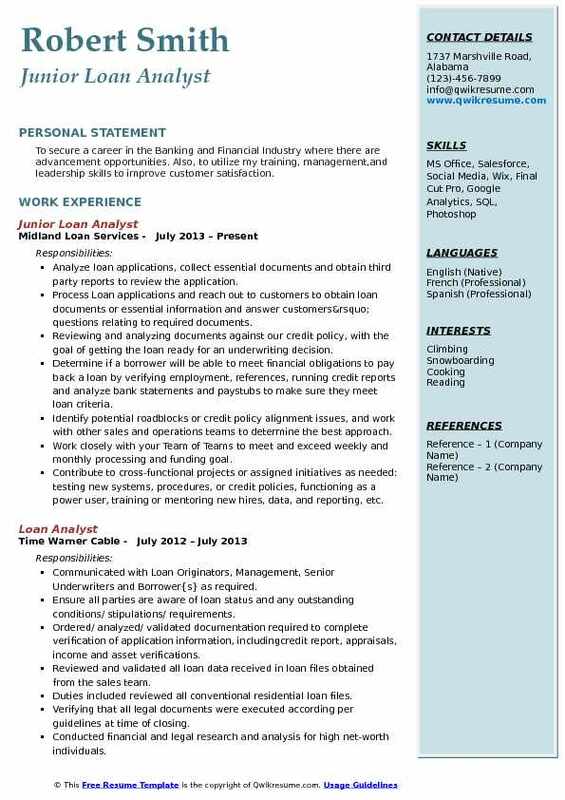 Headline : Professional experience in finance and the mortgage industry both in loan origination and loan servicing Highly skilled and experienced in in research and analysis, attention to detail, and customer relations Proficient and experienced in MS Word, Excel, and PowerPoint. Team leader in pre-screening loans as a Credit Analyst Proven flexibility and ability to thrive in a fast-paced, high-volume environment with strict deadlines. Partner with loan officers and processors to secure, review and index personal and confidential documents pertaining to assets, income, property, and credit to ensure timely loan closings in a high-volume, time-sensitive environment. Train new hires on policy, lending guidelines and processing mortgage loan file from start to finish. Manage, safeguard, review and update and prepare credit loan files for closing. Perform ratio and other statistical analyses to ensure compliance with underwriting requirements. Assist management in upholding department and company standards and creating a positive and productive work environment. Ensure a timely review of loan requests through the credit decision engine system and establish credit decisions in accordance with loan program guidelines. Daily borrower contact for internal Fannie Mae and Freddie mac 500+ loan multi million dollar portfolio. 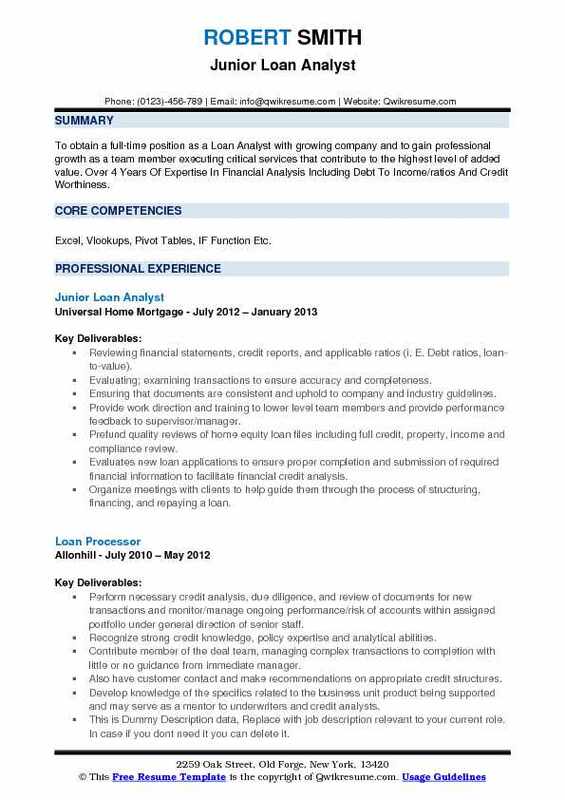 Headline : To obtain a full-time position as a Loan Analyst with growing company and to gain professional growth as a team member executing critical services that contribute to the highest level of added value. Over 4 Years Of Expertise In Financial Analysis Including Debt To Income/ratios And Credit Worthiness. 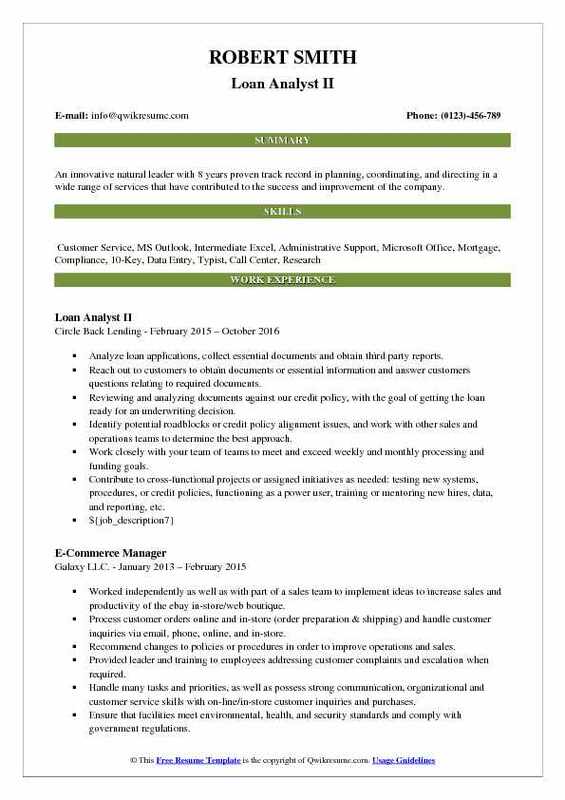 Skills : Excel, Vlookups, Pivot Tables, IF Function Etc. Reviewing financial statements, credit reports, and applicable ratios (i. E. Debt ratios, loan-to-value). Evaluating; examining transactions to ensure accuracy and completeness. Ensuring that documents are consistent and uphold to company and industry guidelines. Provide work direction and training to lower level team members and provide performance feedback to supervisor/manager. Prefund quality reviews of home equity loan files including full credit, property, income and compliance review. Evaluates new loan applications to ensure proper completion and submission of required financial information to facilitate financial credit analysis. Organize meetings with clients to help guide them through the process of structuring, financing, and repaying a loan. Summary : An innovative natural leader with 8 years proven track record in planning, coordinating, and directing in a wide range of services that have contributed to the success and improvement of the company. Analyze loan applications, collect essential documents and obtain third party reports. Reach out to customers to obtain documents or essential information and answer customers questions relating to required documents. Reviewing and analyzing documents against our credit policy, with the goal of getting the loan ready for an underwriting decision. Identify potential roadblocks or credit policy alignment issues, and work with other sales and operations teams to determine the best approach. Work closely with your team of teams to meet and exceed weekly and monthly processing and funding goals. Contribute to cross-functional projects or assigned initiatives as needed: testing new systems, procedures, or credit policies, functioning as a power user, training or mentoring new hires, data, and reporting, etc. 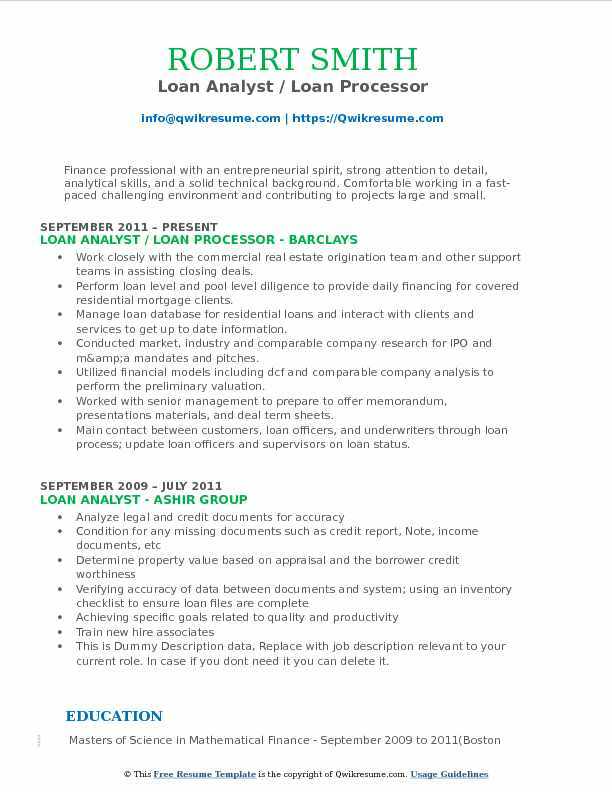 Summary : Detail-oriented Loan Analyst with 14 years of experience in commercial loans. Production oriented professional who excels at high volumes of error-free transactions and meeting goals with good analytical skills. Review legal loan documents such as promissory notes, mortgages, assignment of rents and security agreements and post required document exceptions to ensure collateral is perfected and mitigate risk. Respond to a variety of complex inquiries and issues from the line of business via telephone and email using available tools, guidelines, and procedures. Proactively cross-trained with post quality review to gain the understanding of the process downstream. Partnered with Pittsburgh team on UCC financing statement project. Created new records for 51 borrowers and maintained the integrity of bank data without losing our lien positions. Responsible for reconciling invoice for the mortgage dept (appraisals, flood certs and credit reports). Review and book lease/loan contracts to ensure accuracy and adherence to standard procedures. Summary : A results oriented financial professional with more than seven years of loan processing xperience and proven track record of delivering above target results. Thorough knowledge of lending and collection practice practices, management experience, and excellent project management and customer service skills. Loan/Asset servicing, to include, collections, receipts processing, loan modifications, loan confirmations, opening new loan per loan documents and servicing existing loans as needed. Completing daily, weekly, monthly quarterly and annual data integrity audits to ensure all loans are within compliance. Maintained an error rate of 2% or less for an entire year on all loan documentation packages prepared for every type of loan the bank offers. Review and analyze credit approvals to determine the appropriate loan documents to prepare. Performed audits of special loans assuring compliance with company policies and procedures. in order to meet service level agreement. Headline : 6 years as a diverse professional with proven experience and skills in management, mortgage servicing, accounting, and retail. Strong knowledge and experience in loan origination, project managing, portfolio deal transactions in secondary markets, underwriting, additional experience analyzing and correcting financial data. Job duties are review and analysis of loans with an aggregate total over $1 million and preparing loans for presentation to the bank board of directors. Process payments for customers on accounts that are current, past due and even in foreclosure. Communicate deposit difference with the bank for the correction on deposit amounts and locate the cause for correction. Balanced daily bank deposits and helped other team members locate bank differences. Consult with clients for taxable benefits that those specific individuals may qualify for help answer customer inquiries with tax specific questions and up to date tax law changes. Build personal relationships with clients and offer customers the opportunity through referrals to help build my business. Maintained clearance of payoffs, assumptions, and all requested loan transitions. Summary : Finance professional with an entrepreneurial spirit, strong attention to detail, analytical skills, and a solid technical background. Comfortable working in a fast-paced challenging environment and contributing to projects large and small. Work closely with the commercial real estate origination team and other support teams in assisting closing deals. Perform loan level and pool level diligence to provide daily financing for covered residential mortgage clients. Manage loan database for residential loans and interact with clients and services to get up to date information. Conducted market, industry and comparable company research for IPO and m&a mandates and pitches. Utilized financial models including dcf and comparable company analysis to perform the preliminary valuation. Worked with senior management to prepare to offer memorandum, presentations materials, and deal term sheets. Main contact between customers, loan officers, and underwriters through loan process; update loan officers and supervisors on loan status. 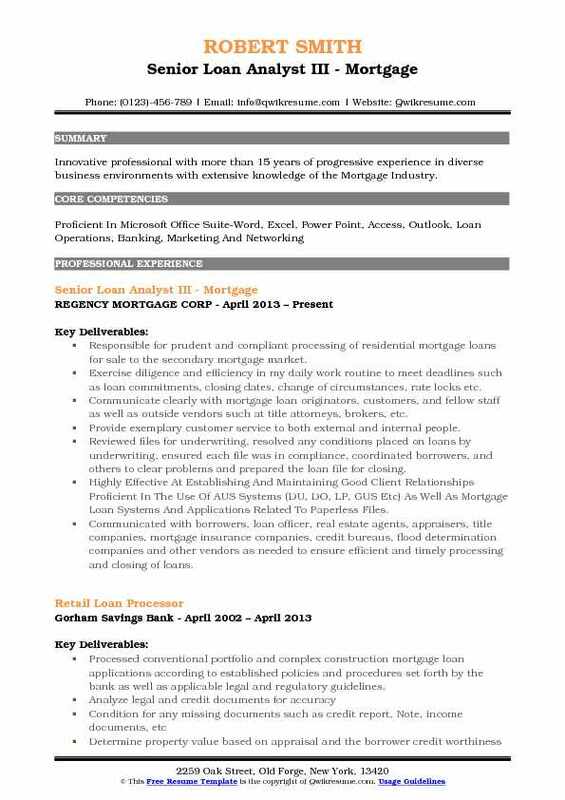 Summary : Innovative professional with more than 15 years of progressive experience in diverse business environments with extensive knowledge of the Mortgage Industry. Responsible for prudent and compliant processing of residential mortgage loans for sale to the secondary mortgage market. Exercise diligence and efficiency in my daily work routine to meet deadlines such as loan commitments, closing dates, change of circumstances, rate locks etc. Communicate clearly with mortgage loan originators, customers, and fellow staff as well as outside vendors such at title attorneys, brokers, etc. Provide exemplary customer service to both external and internal people. Reviewed files for underwriting, resolved any conditions placed on loans by underwriting, ensured each file was in compliance, coordinated borrowers, and others to clear problems and prepared the loan file for closing. Highly Effective At Establishing And Maintaining Good Client Relationships Proficient In The Use Of AUS Systems (DU, DO, LP, GUS Etc) As Well As Mortgage Loan Systems And Applications Related To Paperless Files. Communicated with borrowers, loan officer, real estate agents, appraisers, title companies, mortgage insurance companies, credit bureaus, flood determination companies and other vendors as needed to ensure efficient and timely processing and closing of loans. Headline : Seven years experience in mortgage industry with proficiency in underwriting and due diligence of residential, commercial real estate, and residential construction loans. Skills : Microsoft Word, Power Point, Excel, AS400. Salesforce, Avaya CMS Software, Account Receivables, Accounting And Finance, Clerical And Administrative. Analyze documentation received such as pay-stubs, income tax returns, bank statements, etc to accurately determine income and identity of applicants. Answer inbound phone calls regarding loan programs and the application process. 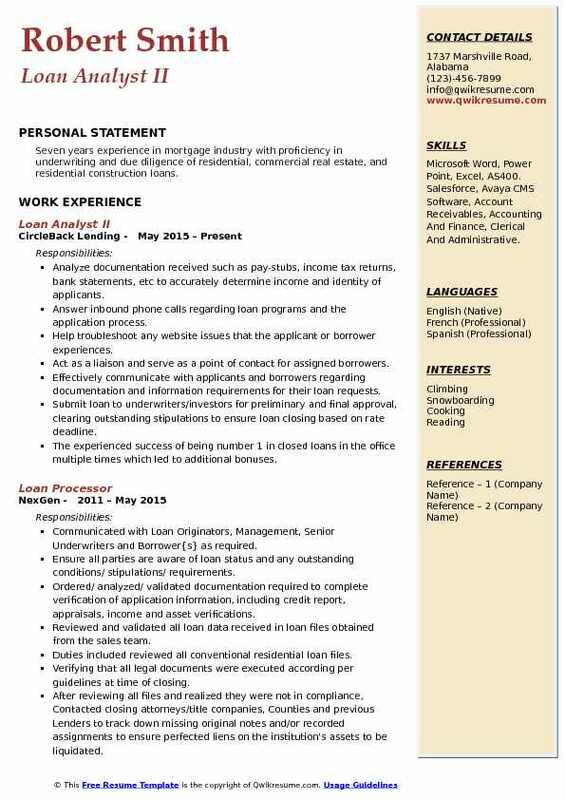 Help troubleshoot any website issues that the applicant or borrower experiences. Act as a liaison and serve as a point of contact for assigned borrowers. Effectively communicate with applicants and borrowers regarding documentation and information requirements for their loan requests. Submit loan to underwriters/investors for preliminary and final approval, clearing outstanding stipulations to ensure loan closing based on rate deadline. The experienced success of being number 1 in closed loans in the office multiple times which led to additional bonuses. 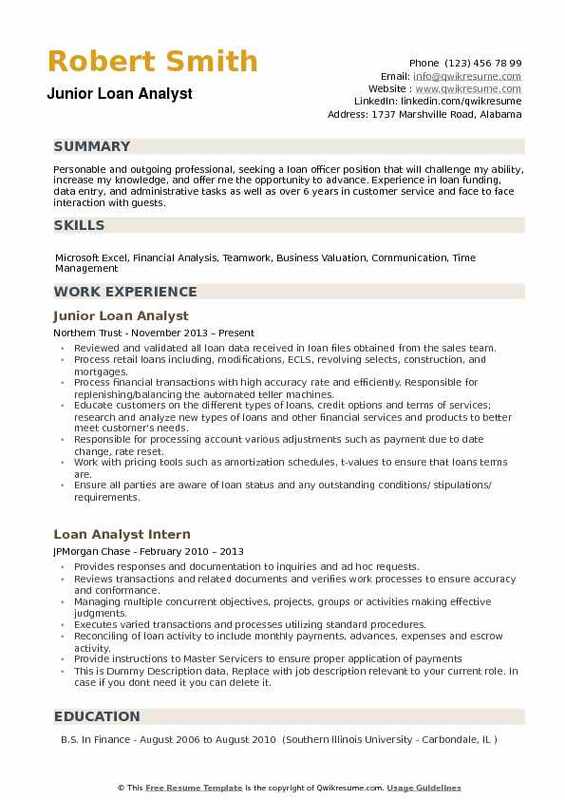 Headline : Personable and outgoing professional, seeking a loan officer position that will challenge my ability, increase my knowledge, and offer me the opportunity to advance. 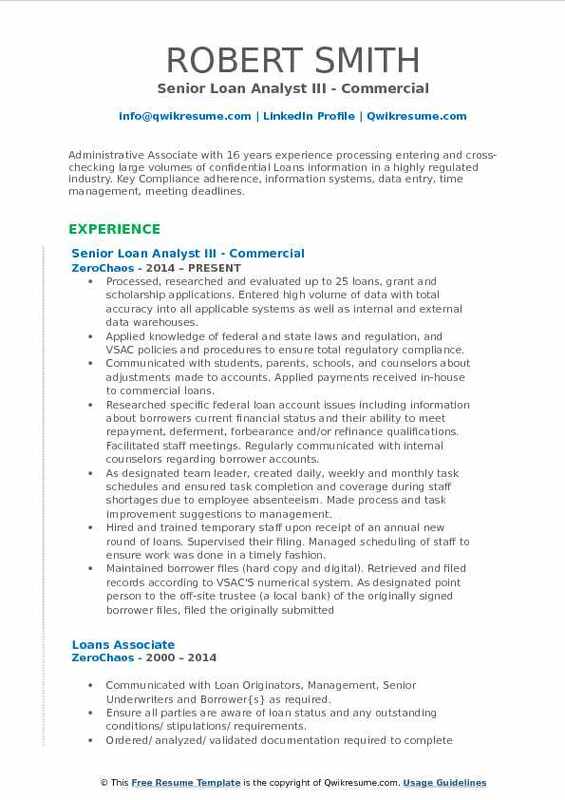 Experience in loan funding, data entry, and administrative tasks as well as over 6 years in customer service and face to face interaction with guests. Reviewed and validated all loan data received in loan files obtained from the sales team. Process retail loans including, modifications, ECLS, revolving selects, construction, and mortgages. Process financial transactions with high accuracy rate and efficiently. Responsible for replenishing/balancing the automated teller machines. Educate customers on the different types of loans, credit options and terms of services; research and analyze new types of loans and other financial services and products to better meet customer's needs. Responsible for processing account various adjustments such as payment due to date change, rate reset. Work with pricing tools such as amortization schedules, t-values to ensure that loans terms are. Ensure all parties are aware of loan status and any outstanding conditions/ stipulations/ requirements. Headline : Strong, dedicated professional with long-standing and diverse experience throughout multiple industries and capacities. Conducted meetings and candidate interviews, tracking projects, attendance tracking, and training support. Articulate communicator with direct sales, education, and health care experiences. Verified and proof read nearly 100 homeowners' information daily including mortgagee clause, loan number, and dwelling amount with insurance company and borrower. Confirmed the borrower's insurance had appropriate coverage and that it was paid in full. Contacted homeowners' associations and requested their certificate of liability for a common area for townhomes and planned unit developments. Ensured the front desk ran efficiently on a daily basis, including the training of new employees. Customer service, obtain, analyze and compile copies of loan applicant's credit histories, corporate financial statements, and their financial information for preliminary and final loan approval. Determine if additional information is required from borrowers and various other sources and if necessary, request this information. Identifies and communicates loan requirements to borrowers from loan set up/ close status to paid of status. 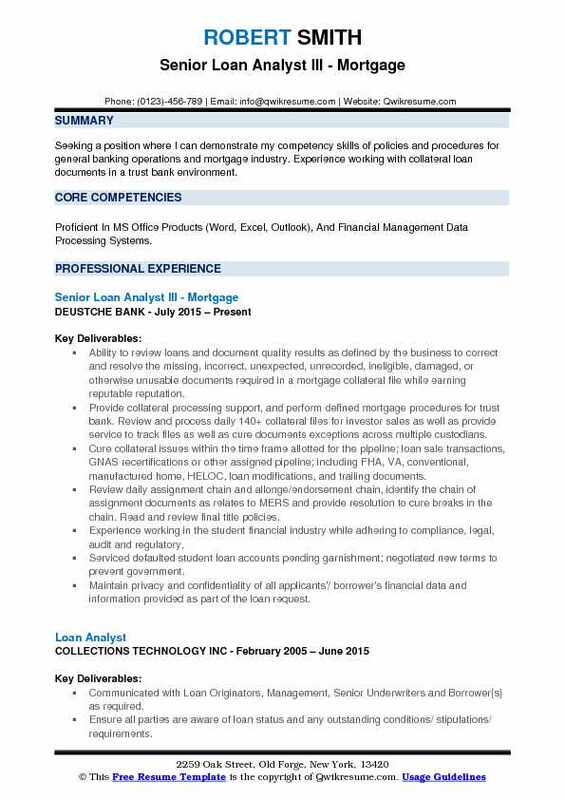 Summary : Seeking a position where I can demonstrate my competency skills of policies and procedures for general banking operations and mortgage industry. Experience working with collateral loan documents in a trust bank environment. 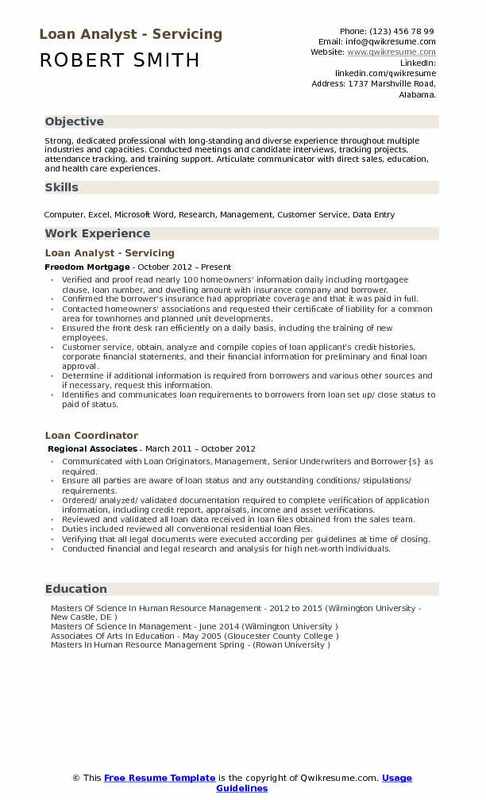 Skills : Proficient In MS Office Products (Word, Excel, Outlook), And Financial Management Data Processing Systems. 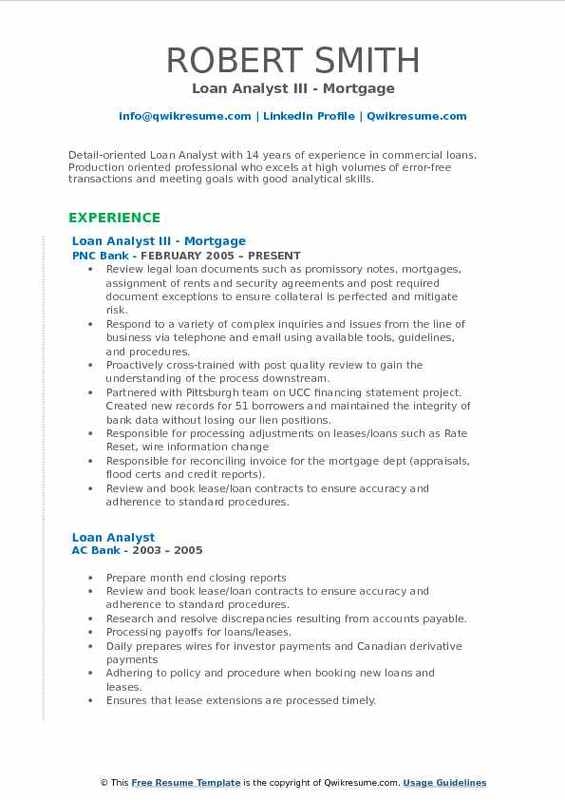 Ability to review loans and document quality results as defined by the business to correct and resolve the missing, incorrect, unexpected, unrecorded, ineligible, damaged, or otherwise unusable documents required in a mortgage collateral file while earning reputable reputation. Provide collateral processing support, and perform defined mortgage procedures for trust bank. Review and process daily 140+ collateral files for investor sales as well as provide service to track files as well as cure documents exceptions across multiple custodians. Cure collateral issues within the time frame allotted for the pipeline; loan sale transactions, GNAS recertifications or other assigned pipeline; including FHA, VA, conventional, manufactured home, HELOC, loan modifications, and trailing documents. Review daily assignment chain and allonge/endorsement chain, identify the chain of assignment documents as relates to MERS and provide resolution to cure breaks in the chain. Read and review final title policies. Experience working in the student financial industry while adhering to compliance, legal, audit and regulatory. Serviced defaulted student loan accounts pending garnishment; negotiated new terms to prevent government. Maintain privacy and confidentiality of all applicants'/ borrower's financial data and information provided as part of the loan request. Summary : Resourceful financial professional adept at recommending loans and managing. Provide flood department training with an 8-year background in flood insurance requirements, loan administration, default management and customer service. Excellent business development and communication skills. Provide the borrowers and loan officers with frequent updates as well as noting the file with any pertinent information needed for underwriting. Send an items needed package to borrowers via secured email, or regular mail and collect information and documentation needed. Conduct weekly pipeline reviews with loan officers on current statuses with files. Provide borrowers with completed commitment letters by deadlines as well as a follow up phone call to the borrowers. Summary : Administrative Associate with 16 years experience processing entering and cross-checking large volumes of confidential Loans information in a highly regulated industry. Key Compliance adherence, information systems, data entry, time management, meeting deadlines. Processed, researched and evaluated up to 25 loans, grant and scholarship applications. Entered high volume of data with total accuracy into all applicable systems as well as internal and external data warehouses. Applied knowledge of federal and state laws and regulation, and VSAC policies and procedures to ensure total regulatory compliance. Communicated with students, parents, schools, and counselors about adjustments made to accounts. Applied payments received in-house to commercial loans. Researched specific federal loan account issues including information about borrowers current financial status and their ability to meet repayment, deferment, forbearance and/or refinance qualifications. Facilitated staff meetings. Regularly communicated with internal counselors regarding borrower accounts. As designated team leader, created daily, weekly and monthly task schedules and ensured task completion and coverage during staff shortages due to employee absenteeism. Made process and task improvement suggestions to management. Hired and trained temporary staff upon receipt of an annual new round of loans. Supervised their filing. Managed scheduling of staff to ensure work was done in a timely fashion. Objective : To secure a career in the Banking and Financial Industry where there are advancement opportunities. Also, to utilize my training, management,and leadership skills to improve customer satisfaction. Analyze loan applications, collect essential documents and obtain third party reports to review the application. Process Loan applications and reach out to customers to obtain loan documents or essential information and answer customers’ questions relating to required documents. Determine if a borrower will be able to meet financial obligations to pay back a loan by verifying employment, references, running credit reports and analyze bank statements and paystubs to make sure they meet loan criteria. Work closely with your Team of Teams to meet and exceed weekly and monthly processing and funding goal.